Twenty seven down, fifty four to go! I am 1/3 of the (winding) way in the block construction phase. Hooray! these blocks are just gorgeous and you’re doing strong work here. 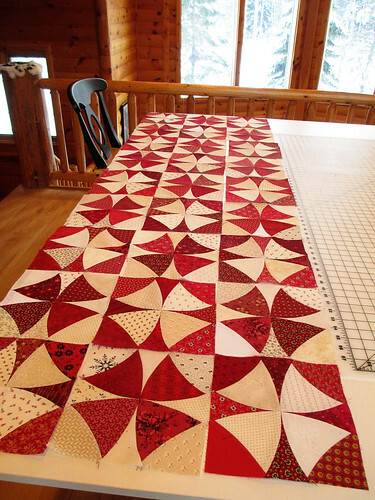 keep after it, because i’m really looking forward to seeing this quilt finished! Thank you, tirane93, for the encouragement. Truly beautiful I just received and am using my cutter for the first time today. I am very disappointed. I wonder if you would comment on how you liad this out on the cutter for a newbie like me. i have tried the strips, and the log cabin and tryly believe I could cut much faster my old way. In regards to cutting the pieces for a Winding Ways quilt, all the cutting for this 81 block quilt was done in less than two hours. Given all the curved pieces, I cannot imagine doing that well using templates and a scissors or rotary cutter. I cut out all the reds and then all the creams separately. I started out with six layers but found that too difficult to crank through the machine so I switched to four layers which worked much more easily. I just covered the die with 8 1/2 by 10 inch pieces, four layers deep. I have used and like the strip cutters, too. I have ordered the log cabin die, but have not received it yet. I can see how you might be able to cut strips faster with a ruler and rotary cutter, but I liked using the GO! for that as well since I am guaranteed accuracy, something I don’t necessarily maintain by using a ruler and rotary cutter. All that said, I encourage you to find your own “best way.” Good luck! Thanks! you have given me hope! Wow that is just gorgeous!!! Lovely. Someone will be lucky to get this one. I enjoy the fact that you are using scrappy fabrics.